Native only to the Americas and nearby islands, agave (also known as a “century plant”) is a spiny, salt-tolerant, drought-resistant succulent that can take up to a hundred years to bloom in dry habitats. But grow it a humid climate (think Sarasota and Venice in southwest Florida), and you might only have to wait two or three years to see it bloom. The stalk can grow a foot per day, topping out at more than 20 feet tall! Now on to the reasons to celebrate agaves. For centuries this prominent member of the Amaryllis family has been used in medicines, food (delicious agave nectar), clothing, paper and rope. And because of its sharp, rosette-shaped leaves, it makes for an excellent “security fence” under windows. But as most all of us know, the agave is most famous for being the source of tequila. Did you know that more than 300 million blue agave plants are harvested each year in the region of Tequila, Mexico? You’d think that with all our modern farm machinery, the harvesting would be fully automated. But planting and tending are still done by hardworking jimadores who use special techniques passed down for generations. Not an easy task, mind you, consider the agave’s hard, sharp ends. Still, you can plant one in your Florida landscape easy enough by grabbing a thick pair of gloves and shovel. Place carefully in well-drained soil and don’t worry too much about high heat or cooler temps; agaves can withstand both. Pests and disease don’t bother them much either. Also watch for “pups” — small plants that emerge from the parent root zone. They’re easy to transplant, or you can give a few to your neighbors. 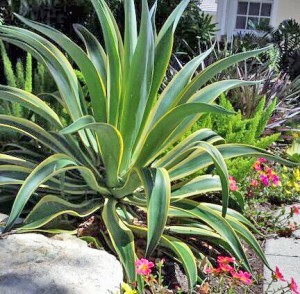 No wonder this amazing succulent is an excellent, low-maintenance choice for your landscape. Discuss the best options for your garden with your local landscape professional … and have a nice margarita while you’re at it. Cheers from ArtisTree!